The professional bolting tools range from Enerpac (A Division of Actuant Corp) streamlines many of Australasian industry’s most common, time-consuming and potentially hazardous maintenance and fabrication tasks. Comprising of some of the most advanced tools all available from one source, Enerpac’s professional bolting tools are backed by a sales and service network built up over more than 50 years. Enerpac National Bolting Manager Mr Pat Molloy explains that the entire range is engineered to increase safety, reduce energy consumption and minimise downtime. Given that maintenance work is fitted into narrow windows of time in infrastructure and resources markets such as mining and energy, oil and gas and infrastructure as well as pipelines and maintenance, hazards and downtime need to be eliminated to avoid impacting productivity. Enerpac’s latest additions such as all-steel torque wrenches and new Z series tensioners and torque wrench pumps are not only designed to save energy, but also allow faster operation and extended performance even in remote locations. Enerpac precision bolting tools include comprehensive families of hexagon and square drive all-steel hydraulic torque wrenches, custom-engineered torque wrench pumps, tensioners, nut splitters, flange spreaders and alignment tools constructed to complete difficult bolting jobs with a high degree of safety and accuracy. Torque wrenches include W series hexagon wrenches, weighing 1.4-12kg but delivering precisely repeatable torque of 2712-47450 Nm. The equally versatile S series double-acting square drive wrenches weigh 2.7-31kg with outputs of 1898-34079 Nm. A tough and versatile new addition to the Enerpac range of non-impact professional bolting technologies is the low- profile W22000 steel hydraulic torque wrench introduced to Australia and New Zealand this year. The highly durable W22000 hexagon wrench, which delivers 30.510 Nm at 700 bar, handles nut sizes of 75-135mm and weighs 33kg. The ergonomic and swift-to-use W22000 is designed for optimum performance, safety and reliability, even in harsh environments in onshore and offshore applications. This model completes the line-up of the W-Series wrench by closing the gap between the W15000 and W35000. 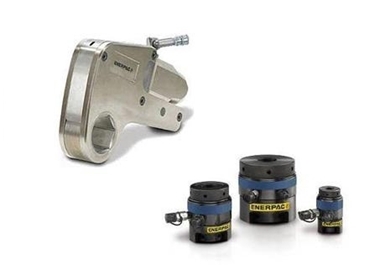 Enerpac has also introduced compact hydraulic torque wrench pumps designed to deliver optimal productivity and reliability with simplified operation and maintenance. The TQ-700E Classic 700 bar electric pump features a brushless motor designed for continuous usage and simplified maintenance in high cycle applications and demanding environments such as wind farms, erection of turbines, installation of gearboxes, maintenance of pressure vessels and pipelines, bolting of tower foundations and numerous other tasks within industries such as mining and energy, oil and gas, construction and manufacturing and maintenance of pressure vessels and pipelines. Enerpac’s TQ-700E torque wrench pumps weigh less than 30kg dry and operate well from generators, making them ideal for mobile plant workshops on mine and resource sites, and field maintenance for dragline, shovel and heavy plant repair. The TQ-700E offers optimised flow curve technology, which maximises productivity of the pump and tool, giving faster ‘per bolt’ performance, while minimising heat build-up and downtime. Featuring a quiet (<85 dBA) lightweight design with a compact footprint, the pump is easy to move around the work site. The TQ-700E works well with portable generators. The ZA4 series ZA4208TX-QE100 pump, which is ATEX 95 certified for use in potentially explosive atmospheres, features a high efficiency pump design with higher oil flow and bypass pressure and enhanced two-speed operation to reduce cycle time for improved productivity. Custom engineered for extended operation in its first stage, the ZA4 modular pump delivers extended performance in ranges required by users working on maintenance and fabrication applications such as pipelines, pressure vessels, tanks, metal structures, rigs and onshore and offshore machinery. The new ZUTP1500 tensioner pump features a remote-controlled valve and universal motor without a hydraulic intensifier, facilitating hassle-free operation of bolt tensioners and hydraulic nuts in remote locations. The latest addition to Enerpac’s robust line of ZUPT series electric tensioning pumps, the compact and lightweight (34kg with oil) pump features a two-stage pump design to provide high flow at low pressure for fast system fills, as well as controlled flow at high pressure for safe and accurate operation. The compact and highly portable ZU4T Series electric pumps weighing 32-36kg, offer auto-cycle for continuous cycle operations and quick, secure coupling by way of Parker spin-on-couplers for 700 bar models and Enerpac lock-ring couplers for 800 bar models. Their high-efficiency two-speed pumps feature higher oil flow and bypass pressure (85 bar) for cooler running that requires 18% less current draw than comparable pumps.